I’ve been catching up on my horror viewing recently, mainly inspired by Halloween and the glut of recommendations that appear at this time of year. The Shining was amazing, Teeth (Mitchell Lichtenstein, 2007) was camp and creepy, Mary Harron’s American Psycho (2000) was even better the second time and Carrie (Brian De Palma, 1976) was dreamy and sad, though somehow not as wicked as I imagined it would be. 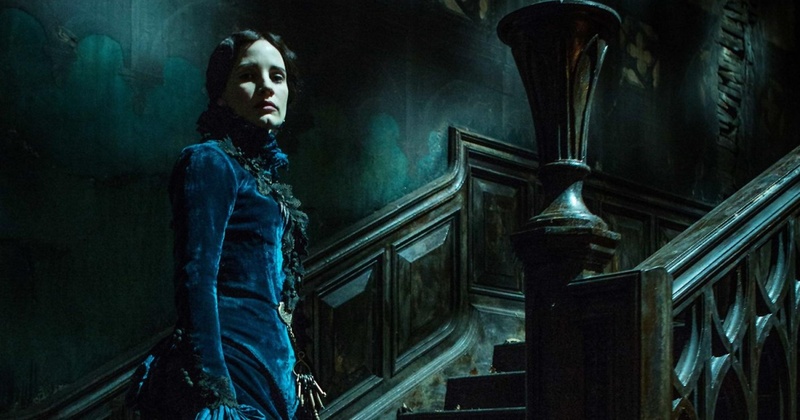 On Halloween night, I saw Guillermo del Toro’s latest film, Crimson Peak, starring Mia Wasikowska as Edith Cushing, an aspiring writer who falls in love with Tom Hiddleston’s mysterious Sir Thomas Sharpe, and goes to live with him and his sister, Lucille (Jessica Chastain) in their enormous, run-down, gothic home. Edith is interested in ghosts, having been visited by her mother’s when she was a child. Her fascination with restless spirits makes her a much more proactive protagonist than those usually found in haunted house films, and gives her a plausible reason to be wandering all over the house actually looking for spooks, rather than run away screaming (which is what I would be doing). Thomas and Lucille have a secret, and del Toro and co-writer Matthew Robbins’s screenplay lets us know this from the outset, as we see Edith’s father become the first victim of knowing too much. Unravelling the plot becomes very easy in the end, as Edith investigates her new home and, as in Hitchcock’s Notorious, is suspicious of the endless tea Lucille offers her to drink. 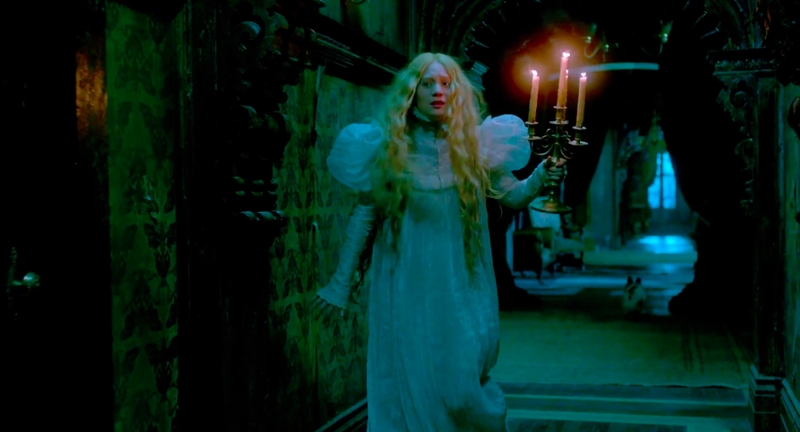 Plot predictability doesn’t seem to be the point of Crimson Peak’s pleasures however, as del Toro signifies danger and horror so liberally that it’s apparent he just wants his audience along for the ride. The blood red clay upon which Thomas and Lucille’s house is built, the large hole in the roof through which leaves and later, snow falls, the myriad dark corridors, and cellar full of padlocked pits, all this contributes to the very effective atmosphere of dread. The film looks fantastic, with Kate Hawley’s costume design, Jeffrey A. Melvin and Shane Vieau’s set decoration and Dan Lausten’s cinematography creating a brilliantly realised romantic, gothic look. Doug Jones, a frequent collaborator with del Toro (Hellboy, Pan’s Labyrinth etc.) here plays two of the ghost characters, including Edith’s mother, bringing a tangibility to their presence and capturing their discomfort and distress. It’s perhaps not as effective as the aforementioned Pan’s Labyrinth due to the lack of surprises, but there’s nevertheless a believable female character again at the heart of del Toro’s film, making it one of my preferred horror tales this Halloween. Did you notice there’s a Bond film on release at the moment? Director Sam Mendes’ Spectre again stars Daniel Craig as 007, attempting to uncover the mastermind behind an evil international organisation. Léa Seydoux also stars as Madeleine Swann, daughter of Mr White (Jesper Christensen), seen previously in Casino Royal (2006) and Quantum of Solace (2008) and she brings an emotional depth to role of Bond’s female partner that’s not been this effective since Eva Green’s Vesper Lynn. Spectre builds on certain classic bond elements that were re-established in Skyfall (2012), such as Q’s (Ben Whishaw’s) gadget workshop and Moneypenny (Naomi Harris) and adds more in too, moving the plot towards a character reveal that’s somehow both satisfying and lazy. 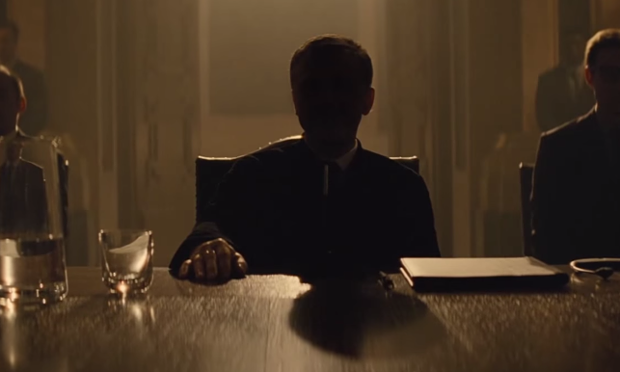 There are some dynamic and elegant action set-pieces and beautiful costuming (because one must always look impeccable whilst grappling with henchmen and chasing down clues) but Spectre is ultimately just a Bond film – a cinematic institution with as many inventive twists as laboured spy clichés.